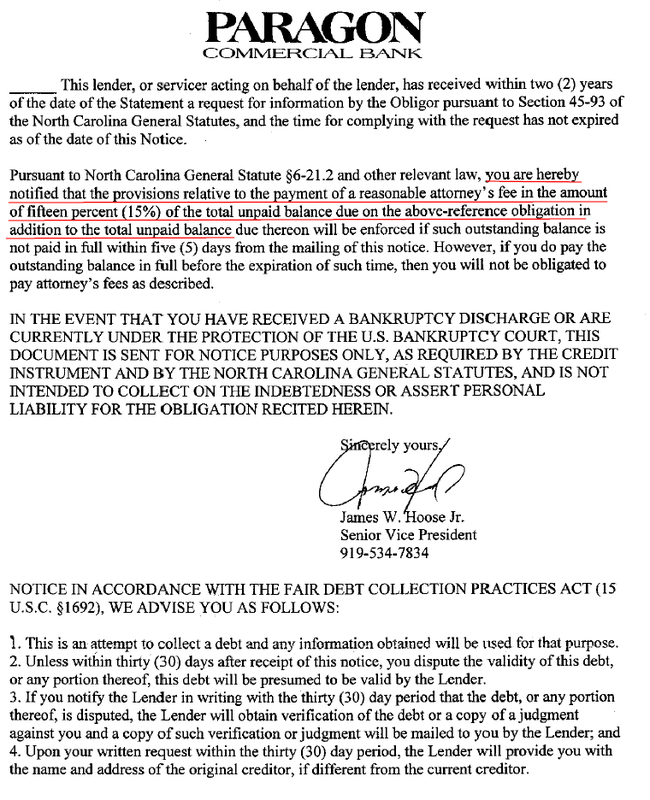 The below letter from Jim Hoose of Paragon Commercial Bank indicates David Warren and Dan Cahill of Poyner & Spruill were to be paid a minimum $765,000 (1) [$5.1 million aggregate loan balance x 15%] for their illicit work in the noted criminal fraud. In other words, they want their victim (Spencer C. Young) to pay criminals a completely baseless fee as compensation for carrying out their fraud against him. NEVER in default, and in the case of Mr. Young's residence . . . It is critically important that these reprehensible excuses for human beings be sent off to the hoosegow. Importantly, they have exposed Poyner & Spruill to significant liability exposure for the damages they have played an instrumental role in causing. This is especially the case, for when the management committee of Poyner & Spruill was apprised of the misdeeds, they took no action, thereby endorsing the illegal activities.